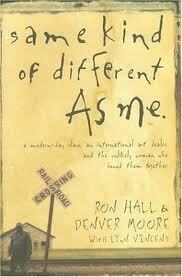 a book chick: "same kind of different as me"
my take: in my work with ladies in recovery i often suggest books for them or read them bits from things i've read, especially from nonfiction works ... recently one of those ladies handed me a book ... what a treat! it's a story of two vastly different men, how they met, and how they changed each other's lives. it reminded me a bit of the mentoring program i was part of a few years back ... each person benefits from cross-cultural (economic and/or ethnic) relationships. an inspirational memoir of the life-changing, mind-expanding, soul-enriching possibilities of stepping out of your comfort zone.